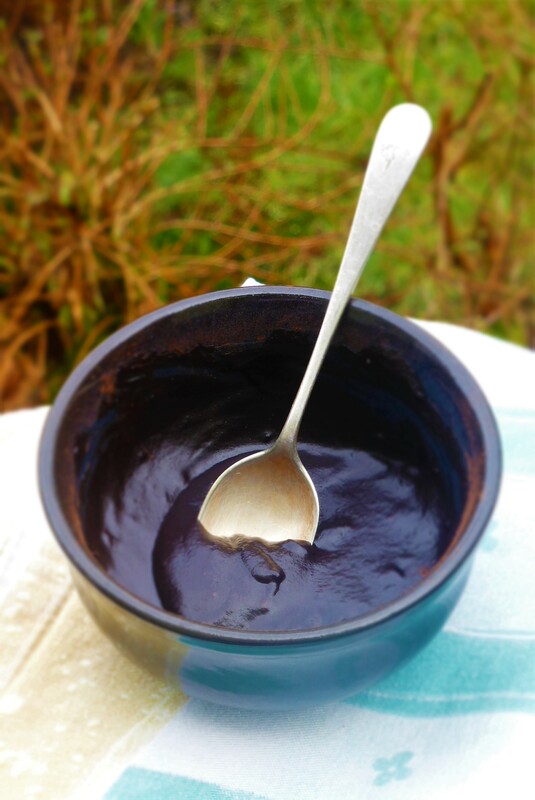 Quick and easy vegan chocolate sauce – good on anything! We love this one! 3 words, easy, rich and delicious, plus 3 ingredients (and a wee twist of salt). On our fantasy dessert island, this sauce would be the ocean. We make this all the time and put it on most things really. Sometimes though, if you’re going wild, the only accompaniment needed is a big ol’ spoon. Of course, there is officially over a million ways to make chocolate sauce (no, more!!) but this is the easiest, apart from opening a packetbottlejar-thing. February seems to be one of those months. Most people are feeling the winter pinch right now, we’re bang in the middle of Feb (sort of) and I think we all need as much sweetness as possible to get by at this time of year. This is not food, this is survival!! Cacao is really high in anti-oxidants so you could kind of say that this is a flu remedy. This sauce will also solidify when poured over cold things like ice cream, or those ice cream sandwiches made out of cookies which are just awesome. Pouring over very cold things will result in a really nice crack and crunch, like the retro chocolate sauce we both had as kids (although Jane is querying the brand here). I think it was called Birds Ice Magic (see below). The mint flavour was my favourite, Jane’s was chocolate flavour. Which is no surprise. Ice Magic was some kind of revolution. Anyone remember it? Ideas for this sauce are of course, ice cream, drizzle over your favourite biscuit/ cake/ pancake/ toast/ fruit/ you get the idea. This sauce rocks on anything!! The great thing here is that with three ingredients, you can balance the chocolate sauce how you like it. Some like it really dark (more cacao/ cocoa), some are sweeties (more sweetener). You may also like to flavour this sauce with things like ginger, cinnamon, mint, orange, vanilla, butterscotch, brandy (just a dash;) this list goes on. Let us know if you try it out. Cacao is unprocessed, well, cacao, which eventually makes chocolate. Cacao powder is a little more expensive but has loads more nutrients and we think the taste is better. We prefer to use coconut oil in this sauce, you can get coconut oil that is low on coconut flavour, if you’re not into that. At a push, you can use other lightly flavoured oils, but we haven’t tried this extensively. Maple syrup is our favourite but any liquid sweetener, like brown rice syrup, agave etc will work nicely. The coconut oil should be melted, liquid, but not really hot. Let it chill a bit. Stir together the ingredients in a bowl until a smooth sauce forms. That’s it!! Cacao has been known as the ‘Food of the Gods’ for centuries in the Americas and it’s easy to see why. The cacao tree produces big pods, where the cacao beans hide and grow. Inside each cacao bean there is a cacao nib (for chocolate) and cacao butter (for chocolate, cosmetics etc). Most chocolates are made with extra cacao butter, or things like soya lecithin, added to make the bar smooth. Cacao is very high in antioxidants and essential nutrients although many of these can be lost when processed into chocolate or cocoa. Some of the apparent health benefits of eating cacao are lowering high blood pressure, high cholesterol, heart disease, asthma, diarrhea, preventing wrinkles, liver, bladder and kidney disorders and many more. The cacao bean is packed full of antioxidants, good fats, carbohydrates, protein, minerals like calcium, magnesium, sulfur, copper, iron, zinc and potassium. They also contain oleic acid which is a heart-healthy essential monounsaturated fat, fiber and vitamins E, B2, B1, B5, B3 and B9 as well as small quantities of vitamin A and C. We think it’s incredible that something as decadent as chocolate, especially raw chocolate, is so wonderfully healthy. We’re working on a new newsletter, it’s out on Friday, click here to sign up. We send it out a few times a year and it takes a minute to sign up. Well – with just 3 ingredients plus a bit of salt there was no need to postpone making this until after a shopping trip, or until I had a spare hour or two. So quick, so easy and SO delicious as well. At a cooler temperature it’s firmer and great as a chocolate spread. Then heated a little it’s transformed into an amazing sauce. Thank you so much for sharing this. I will never again buy any chocolate spread. It’s better than the best I’ve ever tasted!